How does yoga work on body? You must have got to know from various sources about how yoga is beneficial for body(Or if you haven’t yet, then read this post published in 2007 in yoga journal). But the question, that follows when you read more about how yoga is done, is that how does yoga work on human body? How can, bending and stretching ourselves in certain way and holding that for few moments, going to make us healthy? Our understanding about anything related to health is based on visible efforts and actionable data. With regards to yoga, little explanation is available about how it gives us health. This post (and part-2) is about explaining this concept. Let’s start with major components of our body. 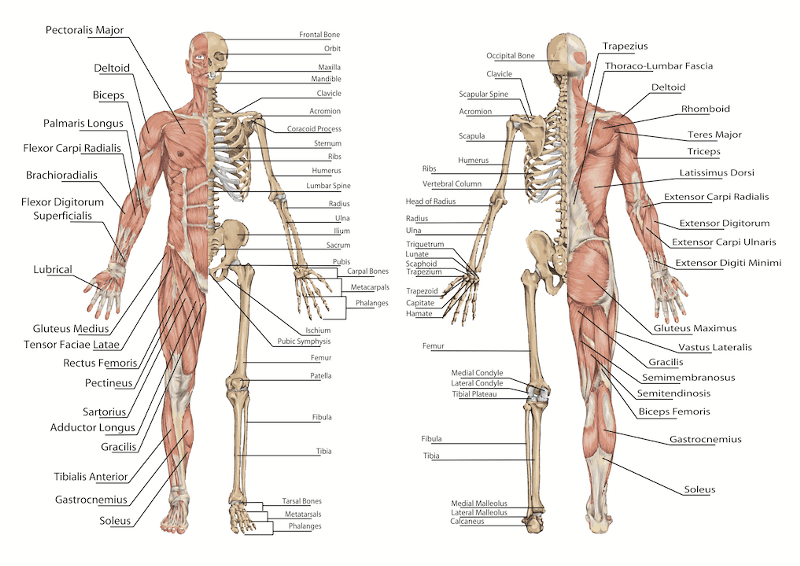 Bones(Skeleton) and Muscles. Bones give our body the basic structure which is then layered with muscles to give us physical shape. After certain age, there is no growth in our bones as well as muscles. But they do require regular supply of nutrients to stay in healthy shape. These nutrients are supplied by our blood circulation system (more about it in part 2 post). Now, these nutrients are digested as per the requirements of our the body part. And requirements comes from work that body part is made to do. Simple as that. As a child, due to active habits of playing and moving around,nearly all the body parts are moved and overall growth happens. Later, due to our lifestyle and entertainment choices, these movements are cut down. Now our body works on basis of priority and requirements. Our brain requires around 40% of oxygen of each breath that we take. Rest is distributed among body parts in order of priority. With changes in our lifestyle and sitting postures, the breathing pattern also reduces in efficiency. This is in addition to, not so good, air quality that we have in cities these days, leads to less then efficient breathing pattern. leads to subsequent health issues like, digestion, blood pressure, tension, dehydration, lethargy etc. It also leads to shortening of muscles in shoulders, back, legs & hip joints and then tightening of those muscle groups. What happens when you hold an asana? When you hold an asana, certain body parts are gently stretched and held in that angle. When this is done, initially there is slight discomfort, but then as breathing is focused on, this discomfort goes away. This is what is felt on broader level. At deeper level, when muscles are stretched, slowly the blood circulation to that area increases. Also, when breathing is getting calm while holding the asana, the quality of blood reaching those areas is better oxygenated. Slowly both these factors, help in nourishing that body part. Along with that, certain internal organs are pressed and gently massaged while holding the asana. This leads to invigoration of internal organs. This simple act, when done for some time is more then enough to tell our body that we need that body part and nourish it. Also the deep breathing that happens with holding of asana, helps in nourishing that body part while holding and when we relax after coming our of asana. Done regularly, these benefits start to accumulate in our body and thus give us a healthy body. You start to get these benefits on major muscles and bones, from first class itself. In next part of this post, I will explain the way yoga works on our deep muscles, blood circulation, breathing and digestion.